It’s king tide season again in South Florida, when an intrusive sea lifts fancy boats to street levels, forces tourists to slosh their way through thoroughfares, and sends cities rushing to erect barricades. Increasingly, local governments appear to be growing more proactive about protecting their citizens and property from adverse forces of nature. All around South Florida, cities and counties are acting not only on their own initiatives, but in concert with others to find ways to defend against sea-level rise and the high seasonal tides that accompany it. It’s not that they need to be reminded about the sense of urgency. In June, the National Oceanic and Atmospheric Administration reported that rising sea levels and frequent storms set flood records across the United States in 2017 — and warned that 2018 could be worse. That poses an increasing challenge for Fort Lauderdale, Miami Beach and other South Florida cities where high tides can inundate low-lying neighborhoods. Also in June, the Union of Concerned Scientists said a new study it conducted found that a million Florida homes worth $351 billion will be at risk from tidal flooding by the year 2100, with 64,000 of today’s residential properties statewide “at risk of chronic inundation” by 2045. “Once market risk perceptions catch up with reality, the potential drop in Florida’s coastal property values could have reverberations throughout the economy — affecting banks, insurers, investors, and developers — potentially triggering regional housing market crises,” the nonprofit U.S.-based group said in a statement. Fort Lauderdale’s preparationsthis year include the installation of more tidal valves (it now has 152), completing designs for stormwater projects in seven neighborhoods, expediting new seawalls in vulnerable island areas, lining stormwater pipes and piloting a project to install high water signs on flooded streets. In Hollywood, the City Commission is poised Wednesday to authorize a vulnerability study and mitigation plan for the city, said Mayor Josh Levy. The effort would create a benchmark from which the city can operate, “even though it’s obvious” that the coastal areas repeatedly flooded by high tides are a priority. In Palm Beach County, planners and resiliency officers from a consortium of coastline cities including Boca Raton, Delray Beach, Boynton Beach, Lantana and Lake Worth met Aug. 24 to discuss how to deal with infrastructure vulnerabilities from encroaching waters, said Megan Houston, director of the county’s Office of Resilience. She said she walked away optimistic that the cities will be able to work in concert. Miami Beach, Miami, and West Palm Beach jointly signed up in early August for help from Columbia University’s Center for Resilient Cities and Landscapes to advance existing infrastructure projects. Some include areas vulnerable to rising waters such as Monceau Park in West Palm Beach, West Avenue in Miami Beach and Brickell Bay Drive in Miami, where aging seawalls and streets have proven themselves unable to handle surging stormwaters. 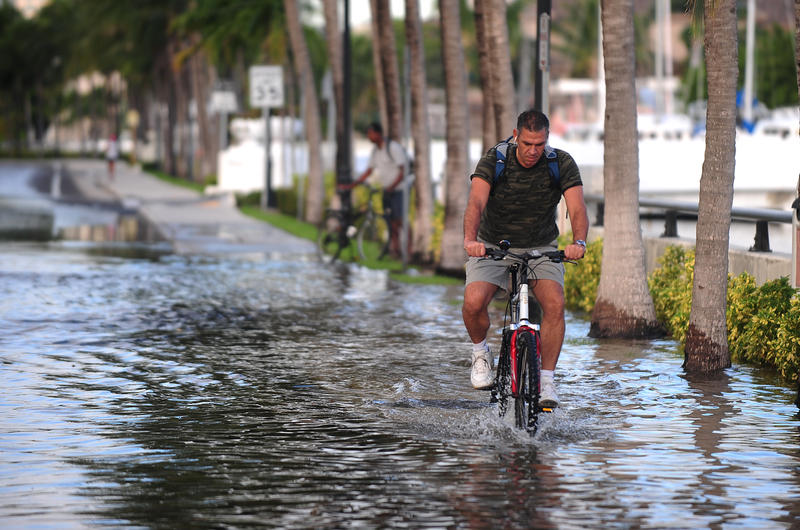 The Southeast Florida Regional Climate Change Compact has scheduled an annual summit for Oct. 24-25 in Miami Beach, marking a decade of collaborative work in identifying the threats of rising seas and finding ways to deal with them. Jurado said Broward has been working on sea-level and climate-change issues since the 1990s, setting standards, devising models to assess sea-level rise, gauging the impact of climate change on water supplies, and updating a 100-year community flood map. She has 12 municipal partners on a project aimed at setting new flood elevations for infrastructure. “It demonstrates that our cities understand the importance of planning for future conditions and working to protect our infrastructure as it relates to flood insurance,” she said. Another early respondent was Miami Beach, which has committed close to a half-billion dollars on pumps, valves and other measures to keep rising waters out of the man-made barrier island. Fort Lauderdale City Commissioner Steve Glassman, whose district is filled with islands where flooding is routine, said sea-level rise and the preservation of infrastructure stood out as a major concern among voters in the city’s municipal elections this year. Academics say that although South Florida has received a more glaring media spotlight over high tides and flooding than many other areas in the country, the region’s local governments deserve more credit for their responses than they’re receiving. “It’s actually something we should be particularly proud of compared to the national scene where the exposed communities may be showing less proactive action than what we see here,” said Colin Polsky, professor of geosciences and director of the Florida Center for Environmental Studies at Florida Atlantic University. “Fort Lauderdale is way out ahead as far as municipalities go and it’s kind of a shame it’s not so evident because what they are doing is not the flashiest of things, but they’re helpful and it’s efficient and it’s exactly what they should be doing,” he added.